“Dad, what are you doing in there? The cat’s terrified!”, demanded Paleovirtus Jr.
“I’m cooking lunch!”, I retorted, somewhat indignant. This entry was posted in Food Diary, Rants musings and gibberish and tagged Frankensoup, leftovers, paleo, soup on December 3, 2014 by paleovirtus. I have to confess, I have a thing about leftovers, and food going to waste. This attitude is a product of what I like to refer to as an Orthodox Northern English Working Class upbringing. Wastage of precious food was simply not an option in our household, and would not have been tolerated. My parents grew up during the Great Depression, and witnessed first-hand real, grinding, poverty, of the kids-going-hungry-to-school-with-no-shoes-on-in-January kind, not some variant 21st. Century faux-poverté, defined as not being able to afford the latest X-Box accessory, or a new flat-screen TV. They were lucky, both my grandfathers worked, so they themselves were never stalked by the spectre of hunger, but what they saw during those times shaped their future attitudes, and in turn, mine. Which brings us to this delightful little lunch I cobbled together just the other day. Mid-day was approaching, my supplies of fruit were running perilously low, and my belly was making it known quite clearly that it expected a cargo of fuel to be deposited in the engine room, and soon. Luckily for me the fridge contained not only a cup or so’s worth of sauce leftover from the previous day’s Country Captain curry, but also a good couple of handfuls of mushrooms. The mushrooms were and still are a bit of a mystery, as for the life of me I cannot fathom out who actually bought them or what indeed they were bought for! They were still looking good to go, however, so after a quick wipe and a trim they were thrown into a frying pan with the leftover sauce and a little extra water, stirred well, and simmered until tender. I ate the resulting curry with some roasted sweet potato wedges. Some pennies saved, and a little precious fridge-shelf real estate reclaimed. Result. 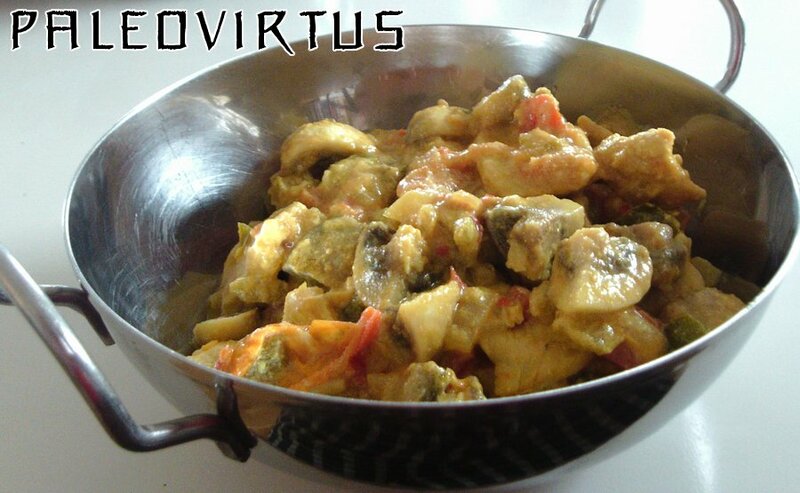 This entry was posted in Food Diary, Rants musings and gibberish, Recipes and tagged curry, Indian, leftovers, mushroom, paleo, recipe on October 15, 2014 by paleovirtus.